Apart from employing HEVC hardware encoder, you can also use H.265 encoding software to transcode video to HEVC quickly and losslessly. H.264 is a great compression standard dominating the market for years. Now it seems that the era of HEVC (aka. H.265) is near. In 2015, Microsoft released the revolutionary Windows 10 which supports HEVC playback natively. This year Apple announced native HEVC support in iOS 11 and macOS High Sierra. In addition, media streaming services like Netflix, VUDU, Fandango Now and Amazon Instant Video have been distributing HEVC encoded content. Numerous examples can be given. So, why HEVC becomes popular? Which hardware supports HEVC encoding in real-time? Is there a piece of HEVC/H.265 encoder software supporting hardware acceleration technology to enhance video to HEVC/H.265 conversion? Support Nvidia NVENC and Intel QSV hardware encoding for H.265. Superfast encoding speed. Transcode nearly any video format (i.e. H.264, AVI, WMV, MKV, AVCHD) to HEVC. Allow video editing (i.e. trim, merge, crop, subtitle) before encoding. More and more hardware HEVC encoders come into being. Let's name a few. In 2014, Nvidia included 4K HEVC hardware encode support on its Geforce GTX 980 video card. In 2015, VITEC released MGW Ace making it the fist 100% hardware-based portable HEVC encoder that offers mobile HEVC encoding. 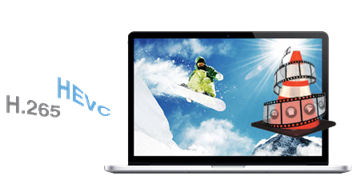 As a matter of fact, you can also convert videos to HEVC without specialized HEVC hardware encoder. You can make use of the best H.265 encoder below to convert video from other formats to HEVC for space and bandwidth saving. Supporting QSV and NVENC hardware encoding for H.265, encoding process will be boosted maximally. WinX HD Video Converter Deluxe is the best HEVC/H.265 transcoder for Windows 10 and lower, allowing users to decode H.265 and encode H.265 at will. It enbraces Nvidia NVENC and Intel QSV hardware encoding for H.265. Thus, you can get the output encoded with H.265 at super fast speed. Supporting 370+ inbuilt video and audio codecs, it is able to convert nearly any video (i.e. AVI, WMV, AVC, MOV, AVCHD, M2TS) to HEVC/H.265. To meet users' different needs, its developer infuses two HEVC profiles into this encoder. One is MKV format, the other is MP4 format. How to Use WinX Hardware-accelerated HEVC/H.265 Encoder to Convert Videos to HEVC? First of all, download the HEVC encoder setup file to your computer, and install it following the wizard. After installation, simply open it and encode H.265 video following the guide below. Step 1. Load the video you want to transcode to HEVC. You can directly drag and drop target items into the main window or click the + Video button at the top left corner to browse and select source files. You're free to input as many files as you need. Videos having rotation angles are accepted as well. Step 2. Choose HEVC as output. WinX HD Video Converter Deluxe comes with two HEVC profiles, one under General Profiles, the other placed in PC General Video category. 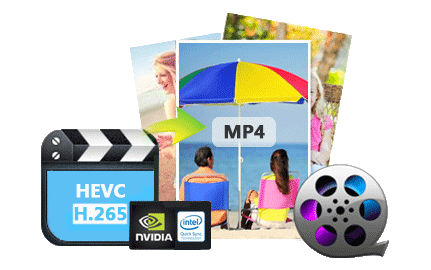 Choosing HEVC Video under General Profiles will give you a MP4 file encoded with HEVC, while selecting HEVC Video under PC General Video will output a MKV file encoded with HEVC. Step 3. Begin HEVC encoding. Simply click RUN button and you will see a new small panel popping up with H.265 encoding progress bar displayed. • Decode HEVC video to fit for devices and programs that don't support HEVC codec natively. • Convert videos among MP4, MKV, AVI, WMV, FLV, 3GP, AVCHD, WebM, MXF, etc. • Edit videos by trimming, cropping, merging, subtitling video, etc. • Free download videos from YouTube and other 300+ sites. • Make vivid photo slideshow videos with desired background music.